Just a touch of light green and very light blue for colour coordination. The tunic is done and resting in India, for the summer. This sure looks dull!Generally I prefer contrasting or complimenting colours.And I have 2 more green tunics to design.And I don’t even like green that much! My friend showed me a tunic in a very soft cotton fabric.I liked the texture and how it draped on the body[ similar to [crepe]. There’s one fabric -mulmul. which is a semitransparent cotton,loves to cling to the body, and with our Madras weather[very humid], we just followed wherever we it went. We kept pulling it away from our skin-very inconvenient, so it was worn as a saree. 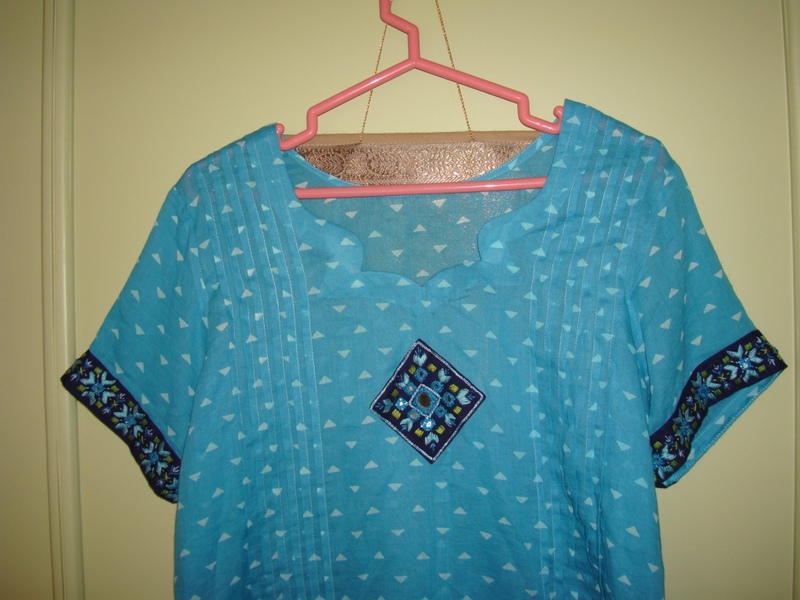 When I went to Madras , I bought a few[1 never seems to be enough for me] of this nameless fabric.This tunic is blockprinted in dark blue.After browsing the wills India fashion week s/s, was inspired to do this pattern. 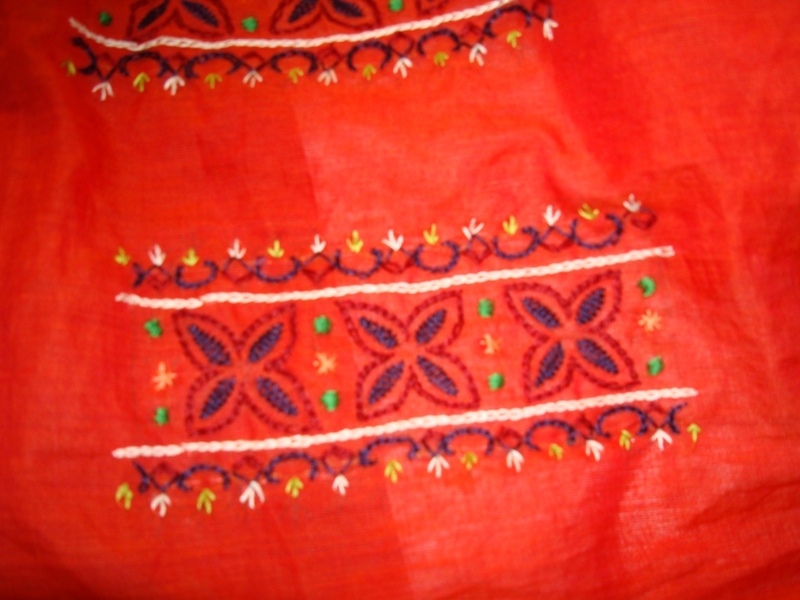 The sleeves were fully done in red.This is the usual gujarati/rajasthani sleeve pattern. The embroidery covers the upper arm.Mirrors,antique gold sequins were also used for embellishing. All the three panels are not seen here,they are all same. 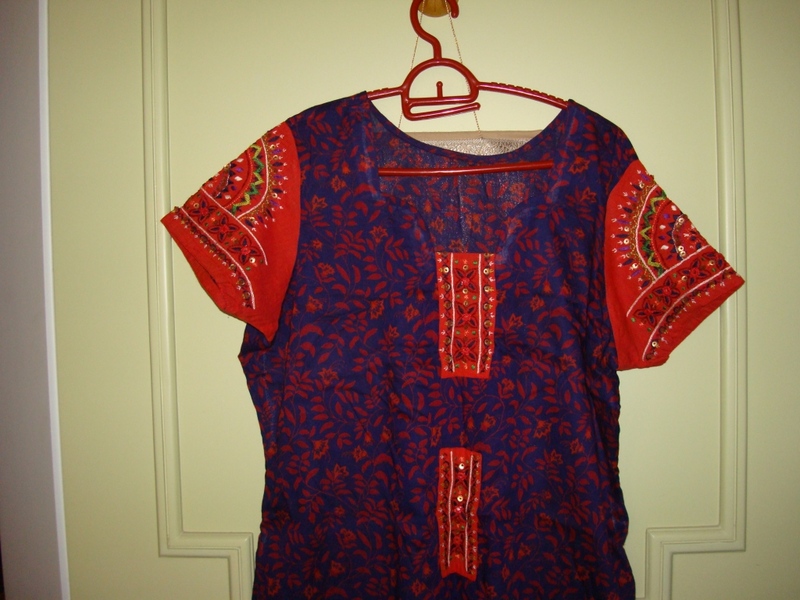 This one is a double colour[violet & medium pink] cotton readymade top. I had to wear a saree for a religious function at my brothers place. It was just before my nephew’s wedding. I had cracked my right pinkie, so my right hand was plastered and slinged.Blouse for the saree is generally fitted to our body, with this huge[not very huge] plaster, I couldn’t put the sleeve through my right arm, my friend suggested I should buy a short top, and wear it for the occasion, which I did. My hubby dear is not too very fond of this very short, loose[XXL]top. It looks like a tent when when I wear it.It fulfilled its need as a blouse,now it is just one more project, maybe It had something to do with the colour I suppose,This top scares him so much,whenever he remembers it ,I have to promise, not wear it or anything like it! 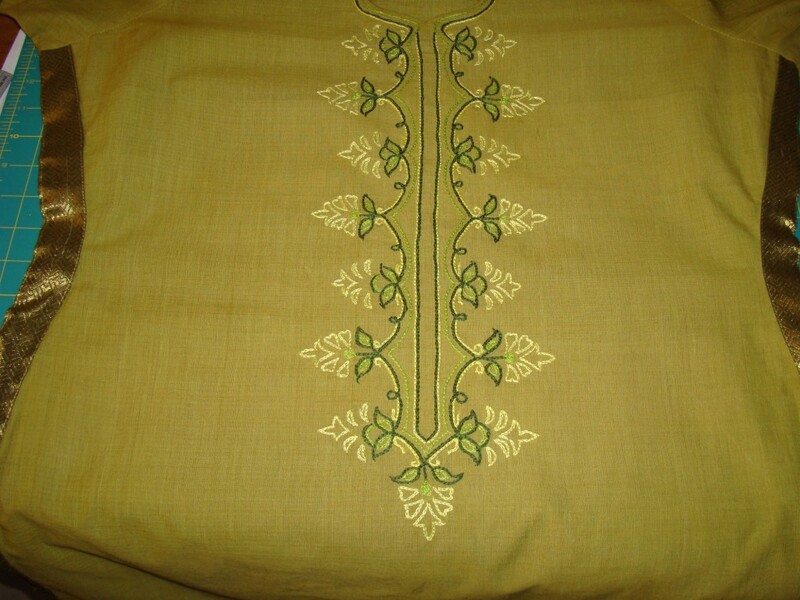 Iam stiil working on some Indian tunic embroidery.This trip I exceeded myself on buying fabrics and supplies. I am repeating this as a mantra[ reduces my guilt].I always say to myself,- Iam doing embroidery only on tunics, Iam not venturing into other styles,now with this shopping spree, it’ll take avery long time to try anything new.I am browsing the net to find inspirations for my designs. 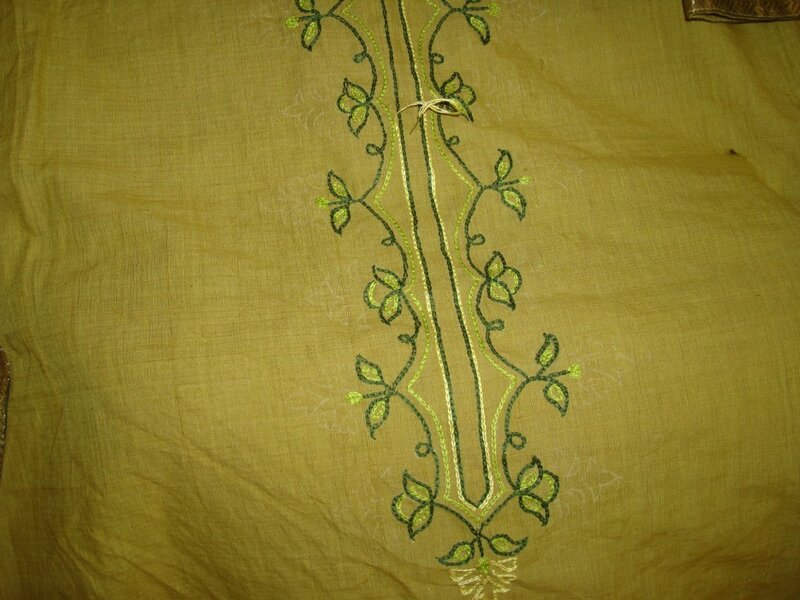 This green tunic was bought a long time ago, some projects have this tendency to sit on the shelf as UFOs rather than completed projects.this was one such case. the designing also was done a few months ago, I started embroidering, then left it for some reason. Now, 2 months ago Iwas able to finish the piece. the inspiration for this pattern was from a book-Expressions by K. Prakash. 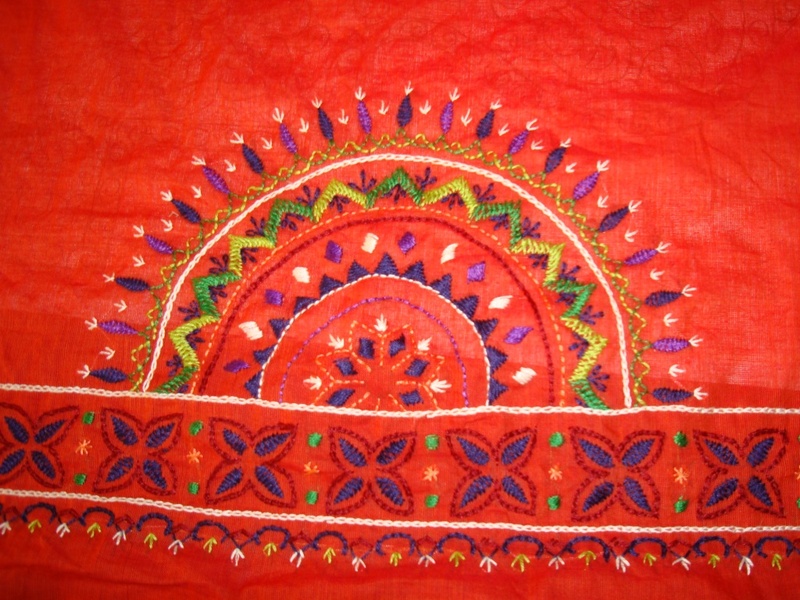 this book is full of traditional Indian designs. Chain stitch was used extensively, a little bit of stem for the creeper[leaf?] Inside border, a line of feather stitch.Antique gold sequin for the flower center. Then I added a few antique gold sequins and beads over the outline. This piece was completed in 4 days. I took the photo before ironing, so it doesn’t look appealing to the eyes. asusual my tailor attached the piece for me. The designing for this yoke was on graph paper.